Read the letter below by Laura Schultz, co-president of the campus’ Beyond Coal campaign. 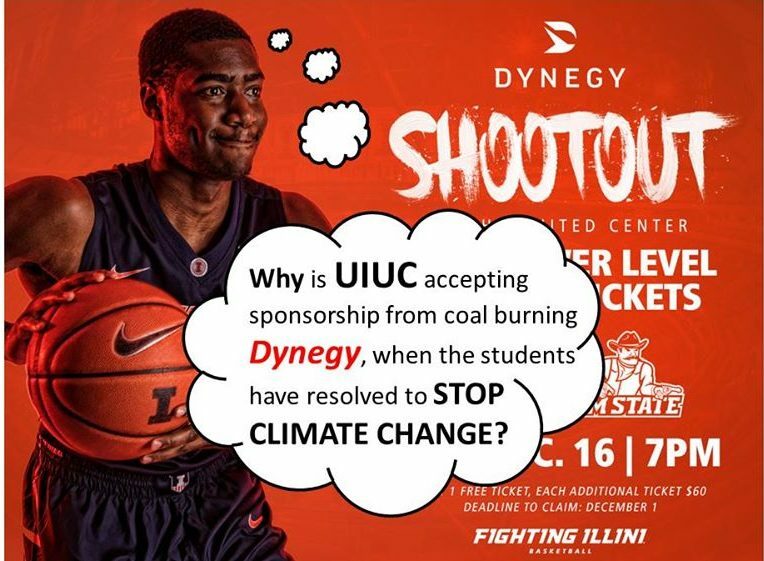 Then join the Illinois Student Government, Students for Environmental Concerns, Eco-Justice Collaborative and Prairie Rivers Network on December 13 as they call on the University to revoke Dynegy’s sponsorship privileges of Fighting Illinois Sports Properties. Yet in the face of these commitments, $5.2 million of the university’s endowment remains invested in coal. Millions of dollars more are still directly invested in oil and gas. And Fighting Illini Sports Properties has accepted a sponsorship from Dynegy, a Texas-based energy production company that operates 11 coal-fired power plants in the state of Illinois. On Dec. 16, the company name will be on full display at the United Center in Chicago at the “Dynegy Shootout,” where the men’s basketball team will be playing New Mexico State University, and Lou Henson — the all-time winningest coach of both team’s programs — will be honored. It is mind-boggling that the university would accept this sponsorship in light of their climate commitments and Dynegy’s track record in environmental damage. In 2015, Dynegy was responsible for nearly half of Illinois’ coal-based carbon emissions, equivalent to half of the transportation sector, and the entire industrial sector. Their power plants have a resounding negative effect on the health of the communities that surround them. Finally, the company’s 11 facilities contain a staggering 70 million cubic yards of coal ash, the toxic leftover waste of burned coal — enough ash to fill the Empire State Building 51 times.